Just got back from a relaxing weekend at the lake, from which I will post pictures next Sunday as soon as I sift through the plethora of them that I took. But for today... Switchfoot concert photos!! I'm sure y'all are sick of hearing about them and are yelling BASTA (enough)! So, this should be my last Switchfoot bit until I see them again... which I'm sure will be a very long time from now (although, that's what I thought this past November :). 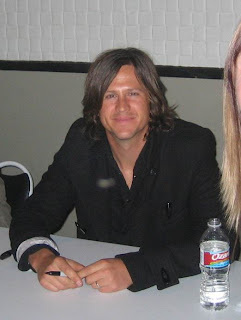 Tim Foreman. Yes, that's my hair on the right... I cropped myself out for posting... mostly because I was REALLY too excited when this picture was taken, and it's just not becomming. LOL. 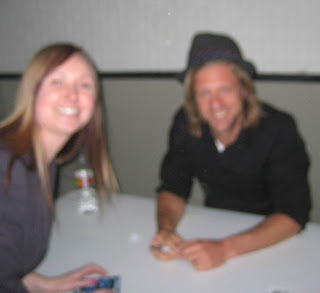 Me and Jon Foreman. I regained composure SLIGHTLY for this one, but alas, it's not in focus. I'm convinced that 10 of the 20 pounds I'm trying to lose are in my cheeks! Seabird - the opening band. VERY solid. My favorite song is "Don't you know you're beautiful." A SUPER freaky picture of Jon that I just couldn't resist posting. I think it may give me nightmares. I hope everyone had a molto bene weekend! Come back Monday for my interview with Kristi Chestnutt! Mmmm...my first time seeing the bass player and I know why you must have been too excited in the first photo! Soooo pretty! I'm also kind of digging the other photo of him with the guitar! NICE! And LOL on the last one! Jealousy! I love Switchfoot, they're tops on my list of bands I want to see in concert! Isn't that great that small point & shoots are allowed now at concerts? God Bless cell phones with cameras for making it happen! So much fun. I would be cheesing out too! Happy Birthday! What a great concert to attend. I just happen to land on your site tonight while watching the olympics :).